If there’s one thing Bell & Ross love more than aviation, it’s skulls. They have been regularly releasing models adorned with the macabre motif since 2009. However, the two themes aren’t mutually exclusive, with their skull-emblazoned pieces referencing the military airborne units of WWII, who used the Jolly Roger as a not-so-subtle symbol of their ferocity in battle as well as to remind them of their own mortality. This year, Bell & Ross continue the tradition, introducing the very clever and, quite frankly, badass BR 01 Laughing Skull. 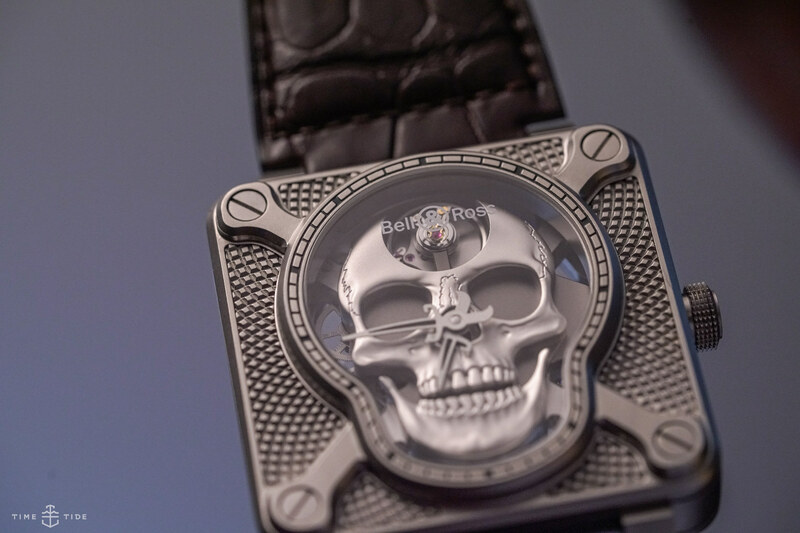 There’s no doubt about it: if skull watches are your thing then chances are so is wrist presence. And here it’s delivered in spades. With a large 46mm square case decorated by a “Clous de Paris” pattern and inspiring thoughts of cutlasses and daggers with its matt microblasted finish. However, it’s the dial that immediately draws your eye. Resembling 2016’s BR 01 Burning Skull, the literal sword-shaped hands are filled with black Super-LumiNova and lowered slightly to now rest over the centre of the skull’s nasal cavity. There are also now glimpses of something new inside, as the skeletonised stage is set for something truly special. You see, by manually winding the crown, the lower half of the 3D skull’s jaw is set in motion, moving up and down like it’s … well … laughing. Needless to say, it’s the most fun you can have with the dial of a watch. Flip it over and the magic is revealed. Sitting behind the sapphire window is Bell & Ross’s first ever in-house movement, the BR-CAL.206. 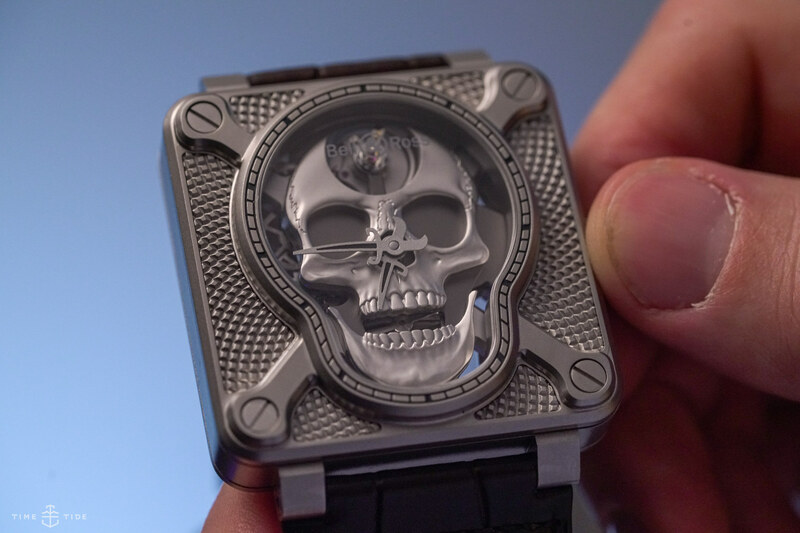 A handwound 50-hour calibre, with a skull-shaped base plate and crossbones for bridges to hold it in place. 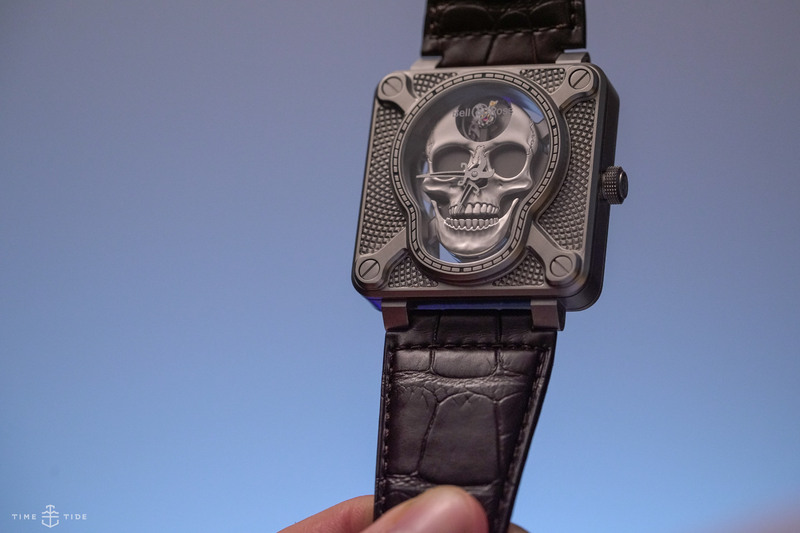 Putting an extra trick and treat up your sleeve, the BR 01 Laughing Skull is an impressive statement piece if ever I saw one. And not just for its wearer, but also for Bell & Ross.